Anyone who knows me knows that, at times, I can lack patience. Give me 200 screaming/whining/complaining teenagers at work and I’ll be fine; but putting me in a traffic jam or expecting me to wait for baked goods to cool before sampling them is just going to end badly. I think this is the reason I’ve never made pickles. Who wants to wait six weeks for vegetables to be ready? I tried pickling cucumbers and cauliflower once using this delicious leftover juice from some pickled radishes my friend got me at Brooklyn Larder, but I ended up breaking down and eating them after about a week. So when I came across a recipe for quick pickling (overnight!) I had to try it. This is from the same magazine by the way, as the grilled strawberry shortcake. There were several different pickling recipes in the article, and I chose to make the carrot one because I had most of the ingredients already. 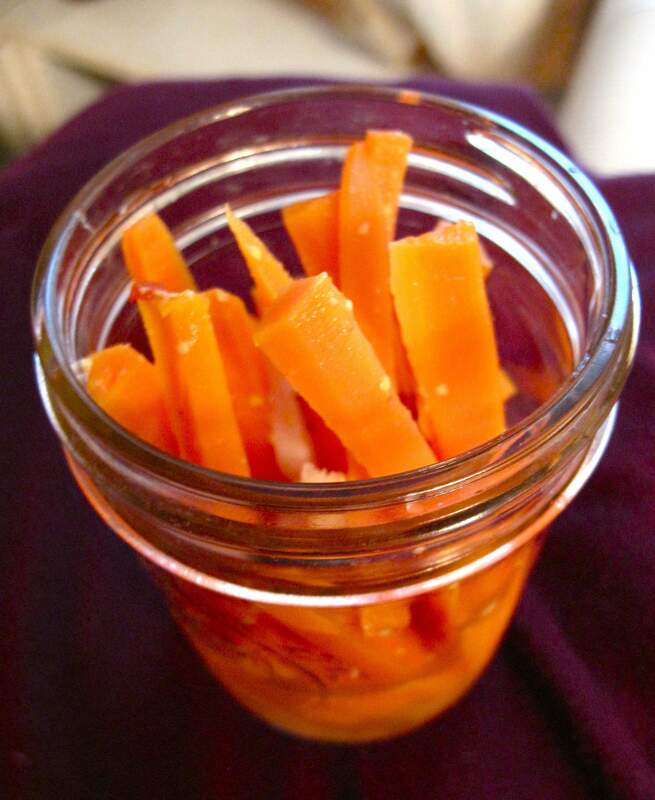 Peel 10-12 medium sized carrots and cut them into matchsticks – imperfection is fine. Prepare a pot containing 3 cups of water, 2 cups distilled white vinegar, 3 tbs sugar, 3 tbs kosher salt, 3 quarter-size thin slices of fresh ginger, 4 garlic cloves thinly sliced lengthwise, 3 tbs yellow mustard seeds, 1 tbs coriander seeds, and 1/4 tsp red chile flakes (side note- I did not actually have mustard seeds or coriander seeds so I substituted a grainy mustard which is almost all seeds anyway and ground coriander). Bring everything in the pot to a boil, then reduce heat and simmer for one minute. Then add the carrots and simmer for another 3 minutes or so. Let everything cool to room temperature and then chill overnight to let the flavors develop. Yes! Just one night. This entry was posted in Cooking adventures, Vegan and tagged snacks, vegan, vegetarian, veggies. Bookmark the permalink. I would be concerned about the ginger overpowering everything – but how did they taste?? Like a traditional pickle brine – or just a flavored carrot?